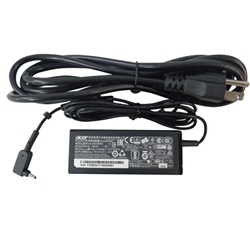 Description: New genuine Acer laptop ac adapter charger with power cord. This part is black in color. This is a high quality 45 watt original replacement adapter. Tip Size: 1.1 x 3.0 x 7.7. **If you are ordering by part # please check the tip of the adapter carefully to make sure that you are ordering the correct adapter. Compatible Part #'s: KP.0450H.001, KP.0450H.003, KP.04501.003, KP.04503.004, KP.0450H.006, KP.0450H.007, KP.0450H.008, KP.04501.004, KP.04501.012, KP.04503.011, A13-045N2A, ADP-45HE BB, PA-1450-26AC, A045R016L, W045R033L-AC01, W045R034L-AC01, W045R035L-AC01. Acer Chromebook C730, C730E, C731, C731T, C735, C738T, C810, CB3-111, CB3-131, CB3-431, CB3-531, CB3-532, CB5-132T, CB5-311.